In one passage of her memoir, Midnight Sun, Arctic Moon, Mary Albanese recounts coming across a cabin in the Alaskan wilderness with her brother. At his request, they camp out there for the night. The next morning the sound of a truck brings them to the door. Outside is a crew of five men with rifles. “Where is my weasel?” demands one of them. A weasel, as it turns out, is not a four-legged mammal, but a tracked vehicle made for getting around in snow. Albanese notices the weasel’s tracks running by the cabin and tells the men they are old and eroded. Whoever stole it drove it away before the last rain, she tells them. Luckily, they accept her assessment and leave. Midnight Sun, Arctic Moon is peppered with such anecdotes and eccentric characters. Inexplicably drawn north, Albanese applies for teaching jobs in Alaska after graduating from college. But, despite the reported shortage of teachers there, she doesn’t receive a single reply. Undeterred, she applies to graduate programs in both teaching and geology at the University of Alaska. She is accepted to both, and with the last of her money, she buys a one-way ticket to Fairbanks. Once in Alaska, a place where the midnight sun keeps summer days bright well into the evening, the author is faced with a choice: teaching or geology? She decides to go with teaching—until the Department of Education chairman makes a last-minute, off-the-cuff remark about wishing he could see the arctic Brooks Range some day. Albanese’s fate is sealed. She joins the geology department, despite not having completed the undergraduate coursework required for the program. 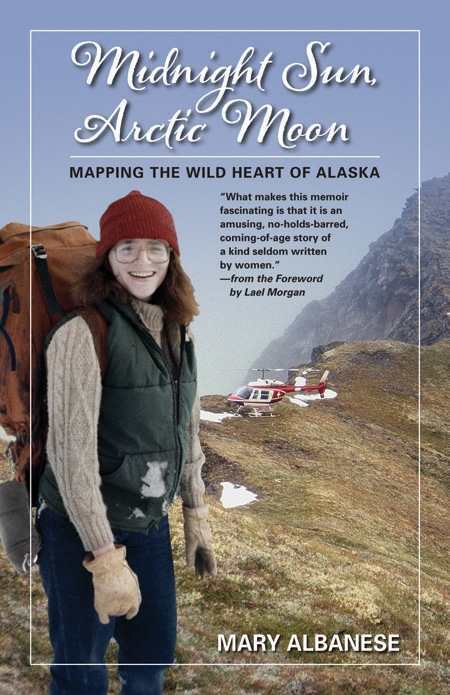 And good thing for us, too—with that single choice, Albanese catapults herself into the life of an Arctic explorer, mapping uncharted territories of Alaska, a practice that required her to be helicoptered in and left for months at a time. Despite entering a male-dominated field, Albanese manages to make a name for herself and becomes a geologist for the Alaska State Survey. An easy and enjoyable read, Midnight Sun, Arctic Moon will appeal to readers of adventure stories and memoir. It will also be appreciated by those looking for strong female characters. Albanese has made Alaska come alive for the reader, and it just may inspire someone to take their own journey up north.